TALKE Group is going for the latest in telematics solutions: beginning immediately, the chemicals logistics specialist will be installing Trimble’s innovative CarCube telematics system in its own trucks and those of integrated subcontractors. The standardised solution will enable further process improvements and offers many benefits for both office staff and drivers. Drivers were actively involved in the selection process for the new system. 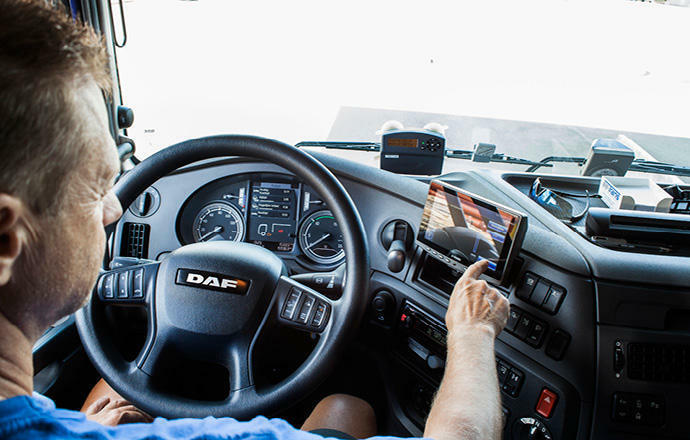 TALKE Group will begin installing about 400 CarCube on-board telematics computers in its own trucks and those belonging to integrated subcontractors in the initial step of the roll-out. The system was developed by Trimble, one of the leading providers of telematics solutions for the transport and logistics industry. It will standardise the telematics systems employed in TALKE’s German, Dutch, Belgian, Luxembourg, and Polish fleets. A total investment of about 1.2 million Euros will be made over the next four years. The modern CarCube telematics system by Trimble is particularly versatile: it transmits all relevant vehicle and route information in real time, such as fuel consumption, travel speed and speed of rotation, acceleration and braking patterns. This way, fleet management can perform immediate analyses and identify potential for optimisation early on. Moreover, the system provides information on driving and resting times. By offering even better options for coordinating individual tours, it makes a contribution to the stability and quality of processes. Drivers also benefit from the new, particularly user-friendly solution in their everyday work. The board computer is installed permanently and offers a full range of useful functions. For instance, CarCube has an integrated satellite navigation system for trucks which provides reliable information on the selected route in a timely manner. The application notifies drivers of any relevant restrictions along the way, such as tunnel codes or height and weight restrictions when passing underneath or over a bridge. Another plus: the CarCube computer gives drivers a signal when it is time to take a break, and considers speed limits and the current traffic situation for its route planning and navigation. For TALKE this new and innovative telematics solution significantly contributes to the ever-growing demands in terms of safety, quality and efficiency in fleet management. TALKE involved its drivers actively when selecting the new telematics solutions. During a test phase, drivers evaluated a total of ten different systems. CarCube was convincing in every category. One example is the driving style assistant: when necessary, it will recommend that the “chauffeur” adapt their style of driving, e.g. in terms of acceleration, braking, changing gears or travel speed. This helps drivers optimise their personal style of driving and increases safety. For the TALKE Group, the Trimble solution is another building block in the implementation of its top-standard safety philosophy, which centres on ‘behaviour-based safety’ (BBS). The driving style assistant uses the same evaluation criteria as TALKE applies in its regular driver coaching sessions held by specially qualified trainers. The CarCube clearly proved to be a good solution in the test phase. Our drivers were enthusiastic about its robustness, its suitability for daily use and userfriendliness, and made it their system of choice. The close cooperation with Trimble also worked extremely well. Fitting the first 400 vehicles with the new system is expected to take until the end of 2015. TALKE Group, founded in 1947, is among the world’s leading logistics service providers to the chemical and petrochemical industry in Europe, the Gulf States, India and China. The company’s core competencies include the transportation and storage of chemical products, liquid chemicals and hazardous substances of almost all classes. TALKE also offers filling, storage and transport services for dry and liquid chemicals and polymer granules. Moreover, the logistics specialist offers tailor-made contract logistics solutions, state-of-the-art outsourcing concepts and planning and project management services for the construction of logistics facilities. TALKE Group employs around 2,200 employees at 42 sites in Europe, the Middle East, India and China. Over 2,300 tankers, silo trucks and containers and an extensive range of special equipment to suit individual customer needs for both road and intermodal transports are at the Group’s disposal in order for it to provide its reliable transport and logistics solutions. The company won the 2004 German Hazardous Goods Prize, which is awarded every year by the editors of “Gefährliche Ladung” (Hazardous Cargo) magazine, for its safe handling of sensitive goods and continuous improvement of transport safety. TALKE Logistic Services is a member of the Responsible Care programme, and was one of the first logistics service providers in Germany to join this initiative in 2009. TALKE Group is among the world’s leading logistics service providers to the chemical and petrochemical industry in Europe, the Gulf States, India and China. The company’s core competencies include the transportation and storage of chemical products, liquid chemicals and hazardous substances of almost all classes. Logistics service providers to the chemical and petrochemical industry. Core competencies include the transportation and storage of chemical products, liquid chemicals and hazardous substances of almost all classes.